Today I'm happy to share with you 24/7 - Jesus Makes a Way Every Day! from Abingdon Press. As I said last year, while the primary audience for this resource may seem obvious, I want to challenge and encourage you to take a serious look at 24/7 - Jesus Makes a Way Every Day, whether your church is made up primarily of one race or a mix of different races. I personally believe this would be an excellent resource for any church, as we all need to honestly face prejudices and mis-information in ourselves and deal with them as God wants us to, so we are able to help the children in our ministries grow up to truly believe with all their hearts the song they learned as little ones - "Jesus loves the little children, all the children of the world. Red, brown, yellow, black and white, all are precious in His sight. Jesus loves the little children of the world." In this day and age where racism, anger, mistrust and misinformation divide us - in our communities and sadly, in our churches - more than ever, 24/7 - Jesus Makes a Way Every Day is a resource which can help bridge the gaps which divide, by helping us understand others and believe the truth - "Loving God is never separate from loving our brothers and sisters. It is always the same." (Clementa Pinckney) Absolutely take a serious look at 24/7 - Jesus Makes a Way Every Day, and whether you use it for VBS or not, find a place in your ministry where you will use it. Come Again?! - Luke 18:1-8a - Jesus tells a story about a woman who gets justice from an unjust judge - Never Give Up! Dressed by God - Luke 12:22-31; Philippians 4:5-7 - Jesus describes how God cares for birds and flowers - Stay in Prayer, Because God Really Cares! Message/Theme – "The lessons are based on stories Jesus told of how God provides every hour of every day, so we might have life and live it to the fullest!" 24/7 - Jesus Makes a Way Every Day has strong, SOLID Bible content, daily evangelism focus and invitation and focus on helping us see and understand what abundant life is and how to experience it. Lessons engage the children - I'm very happy to see this. Once again this year I LOVE the "Parent Empowerment Pages" with tips for empowering parents, devotionals, Scripture, activities, prayers, resources and more - I LOVE this - it is excellent for grandparents, too - I'd love to see all VBS publishers include a resource like this in their material! I LOVE "Outreach/Follow-Up" info - focus on helping children understand what they have learned and how it lives in their lives - could absolutely use this - or more of it after VBS to engage and involve children in serving their community! Excellent! I LOVE the focus on affirming to children how valuable they are. I LOVE the daily Invitation to Discipleship where children are invited to follow Jesus and give their lives to Him! Excellent! I LOVE the focus on generations passing on a heritage of faith - excellent! I really like how each day's Scripture is provided in three or four different versions - excellent focus on understanding. I found the options for crafts to be creative, varied, affordable and fun. I LOVE the Community Art Project - String Prayers! It is amazing! I love how it involved the generations in a hands-on activity to get them praying! Excellent! The "Heritage/Drama" portion is a great way for children to learn about their heritage/people who showed their great value and strength and it is also an excellent opportunity for those of us who are of a different race, to learn the truth about others who we may not really know. Excellent information on engaging children with special needs. 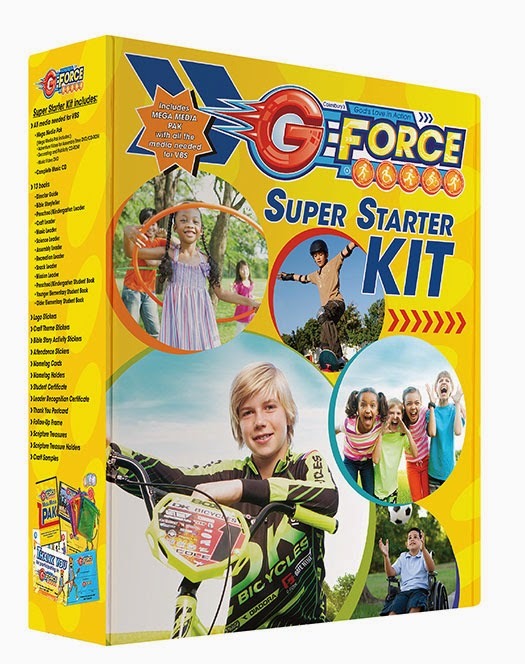 Information about how to keep your VBS safe with volunteer screening, severe weather/fire, etc. 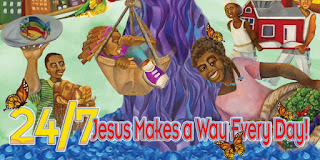 Abingdon says, "With 24/7 - Jesus Makes a Way Every Day, Children, youth, and adults will have fun discovering abundant life is based on a strong faith foundation, sharing in community, seeking justice, persistent prayer, and the forgiveness and love of Jesus Christ. They will hear God's Word provides a firm foundation for everyday life, experience God's abundant life through community sharing and fun, be introduced to people who inspire abundant living, come to believe God's forgiveness is just what they need and understand the overall Scripture, 'I came that they may have life, and have it abundantly.'" —John 10:10, NRSV"
Once again this year, I really LOVE how 24/7 - Jesus Makes a Way Every Day focuses on helping children learn God's Word, with a strong focus on understanding how the foundation for abundant life is practicing God's Word, abundant life is experienced by sharing what God has provided, God will hear those who cry out day and night - persistent prayer requires faith, prayer is always needed, a thankful heart is the key to abundant life and how to experience the miracle of forgiveness to choose to live life to its fullest! A much-needed message for every child - and adult. 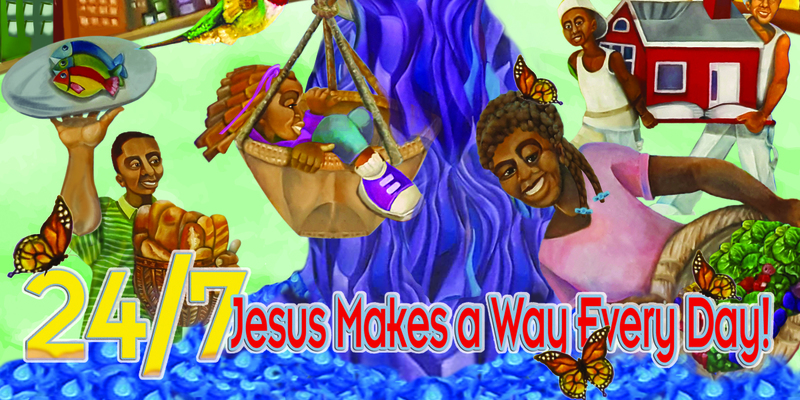 Definitely take a close look at 24/7 - Jesus Makes a Way Every Day for your VBS this year - and like I said above, if you do not use 24/7 - Jesus Makes a Way Every Day for VBS, absolutely find a place to use it in your ministry - no matter what color the children are in your ministry. You will be so glad you did!